We grabbed our bags from the overhead compartments and shuffled down the aisle like crabs towards the ocean. The hostie said “Thanks” without looking up from what he was doing and a wave of balmy, Brisbane-winter air washed over us as we set foot onto the stairway. It had just gone 7pm and we were an hour late after blankets of fog had shut down the airport in Brisbane earlier in the day. It had been about six weeks since we moved to Melbourne but the Gold Coast Marathon had been circled on my girlfriend’s calendar for many months. She bemoaned the new environment we’d found ourselves in to finish off her training before the race. Late sunrises and single digit temperatures were a rude change from the sun-flushed early morning Brisbane river circuit she’d been used to. As we walked through the terminal peeling off the previously required layers of clothing, my girlfriend scoured weather websites praying for rain. Apparently running forty-two kilometres in twenty-two degree heat isn’t ideal? Meanwhile, I checked my watch to see if I still had time to head out to Yeronga to see my Thirds play Bribie Island that night. 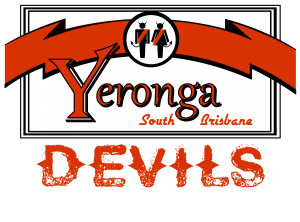 I arrived at Cansdale Street with a few minutes remaining in the 3rd quarter and the hometown Yeronga Devils down three goals to the Bribie Island Bulldogs. I’d seen our team list on Facebook earlier that afternoon – it looked a very good side on paper. They were up against a tough team. The Bulldogs were top of the table, full of young kids with clean hands, fast legs and long hair. At our previous meeting up on the Island they’d used the wide ground and dry conditions to run rings around us en route to a thirty-nine point dusting. Tonight however, the QAFL’s showpiece ground was deceptively dewy, limiting the opportunities for Bribie to spread and run. Three goals didn’t seem impossible. After a very respectable three-quarter time spray from the coach, Dingo, the home side started off the fourth quarter with a whimper as the Bulldogs slotted one through within the first two minutes. Twenty-four points was perhaps a little wide for our blokes to run down, having only forced the left hand of the goal umpire into action three times in the previous three quarters. I took up a position behind the Devils scoring end and had a chat with a few former players who came to the ground for most home games. They informed me that the contest had been neck-and-neck until the last part of the third quarter, when Bribie had kicked three straight in quick succession. The Devils hit back with two quick goals, cutting the margin and restoring some belief. Another Bribie major tempered things but again the home side responded with a goal, keeping the game within twelve points. After a tense ten minutes, Yeronga slotted a beauty from the left sideline and were within a kick of winning the game with about a minute to go. Later on, in the club house, we laughed as Harry Taylor missed his attempt after the siren that would have given the Cats the win and I pondered the coincidences of life; that we’d see the only AFL game on that night almost replicate the situation at a Thirds game in Yeronga. Fortunately for supporters of the black and the red – the few of us sinking cans and leaning on the flimsy white plastic picket fence around the ground – Harry Taylor didn’t take the last shot at goal for the Devils. Instead, it was the 76 year old (approx.) now-club hero, Carts. After taking a wonderful double-effort grab against at least three (some say four, even five) Bribie Island players deep in the forward pocket with twelve seconds on the digital scoreboard, Carts walked back from the mark and pulled his socks up (or regained his breath). As the siren sounded, the Bribie players stacked the mark and wished Carts the best using slang that, fortunately for him, people over 50 probably wouldn’t understand. As the ball left the boot, the ump whistled! Was it a 50? It looked as if a Bribie player had come in too close from the side of the mark. There was confusion and chaos as Yeronga players embraced and whooped it up. I feared they were getting ahead of themselves but the umpire walked to the square and consulted with the goal umpire – who gave it the double dukes! Carts didn’t need a 50m penalty, why bother when you can just put it straight through? I ‘spose when you’re 83 you don’t want to waste any time. They were buzzing from the win, all broad smiles and disbelieving shakes of the head as steam rose up off their shoulders, even in the warmth of the Brisbane winter. It was good to be back there and to see them like this. I followed the team into the change rooms filled with the smell of grass and sweat and deep heat and watched them bellow out the team song as loud as I’d ever heard them do it. Dingo joked and laughed his way through the “best on” recognitions. I went to the clubhouse to share a beer, a chat and some easy laughs over mis-matched recollections of the game that only a hard-won, barely believable victory could summon. It doesn’t take long for things to change in life. In the six weeks that I’d been gone there were blokes who’d bought houses, got new jobs, new girlfriends. The footy was the same but the footy was different. They’d won four on the trot and I felt a mixture of jealousy and pride and an immense happiness to be back home despite having only just left. As we boarded our flight back to Melbourne on Sunday night I thought about Friday night and about footy. About how being part of a footy teams is unique. About how glad I was to get down to see the team win on Friday. My girlfriend plonked down in the seat beside me, exhausted. A goal after the siren on Friday night wasn’t the only incredible thing that had happened that weekend in my books. 42 kilometres in 4 hours and 23 minutes. Wow.